Going Organic Helps A Small Dairy Stay Afloat Up before dawn seven days week, Tim Maikshilo and Kristen Dellert still couldn't turn a profit off their conventional northern Vermont dairy farm. But after a couple of years with an empty barn, they gave it another go — this time, as part of an organic co-op. After the morning milking, the cows head out to graze on the 146-acre farm. It's awfully tough to make money selling milk. Small dairy farms have been hit particularly hard by the recession, with milk prices at near-historic lows. Still, some farms are fighting the odds. For one family dairy way up in northern Vermont, the way to survive was joining a co-op and going organic. 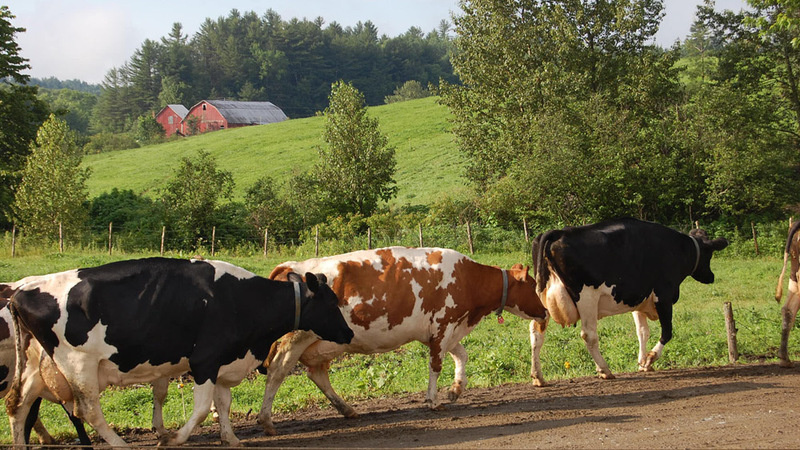 The scenery in Coventry, Vt., is idyllic: Black-and-white dappled Holsteins and fawny brown Jerseys graze against a backdrop of rolling green hills and the occasional red barn. Despite the Rockwell-esque setting, the first dairy farm Tim Maikshilo and Kristen Dellert started here — a conventional dairy with about 50 cows — didn't make enough money to support their family. "We moved up here from Connecticut because Tim wanted to be a dairy farmer. It was never my intention to be a dairy farmer — the dairy farming was Tim's big dream — and as a speech pathologist I could work just about anywhere," Kristen says. They moved to Vermont in 2000, and they realized right away it was going to be a lot of work — for the whole family. "The first time, went into barn, and Tim says to me, 'That cow's in labor over there, you need to check her,' " Kristen recalls. "So I go behind the cow. Her tail is up, 'Yup, she's in labor.' He says, 'No, put a glove on, make sure nose and feet are coming out,' and I'm like, 'I have a master's degree!' "
Yet Kristen learned how to birth a baby cow, along with many other dairy chores. Through it all, she kept her full-time day job. And, seven days a week, Tim and their teenage son, Max, got up well before dawn to milk the herd. But they still weren't making enough to live on. With the help of their teenage son, Max, Tim Maikshilo and Kristen Dellert run the small organic dairy by themselves. They say being a part of the co-op Organic Valley has been an enormous support and resource for them. "Tim said, 'You know, we're working 18 hours a day, seven days a week, and we don't get to set price for product.' He said, 'This is crazy,' " Kristen recalls. They realized it just wasn't working. "So we sold the cows, and Tim did a construction business, excavating business — I kept working as a speech pathologist." But after a couple of years with an empty barn, they decided to try again. This time, they would go organic. Kristen says she's always felt organic farming is healthier for the cows and the environment. It means the cows must be given feed grown without pesticides, and they can't be given antibiotics or growth hormones. And, for at least three months a year, the cows have to be out on pasture. "We know that there is a growing movement of consumers out there that are truly concerned about where their food is coming from, and what is — and is not — in it," says Kristen. Another factor was the money. Conventional farmers generally get paid less for their milk than it costs them to produce it. "So they're losing their shirts, basically, just to stay in the business," Kristen says. Meanwhile, organic farmers are selling their milk for a slim profit. Depending on the month, they can bring in double what a conventional farmer makes per gallon of milk. This doesn't automatically translate into a profit; the organic cow feed is expensive, as are the organic remedies for sick cows. Also, the price fluctuates depending on weather, growing conditions and fuel costs. 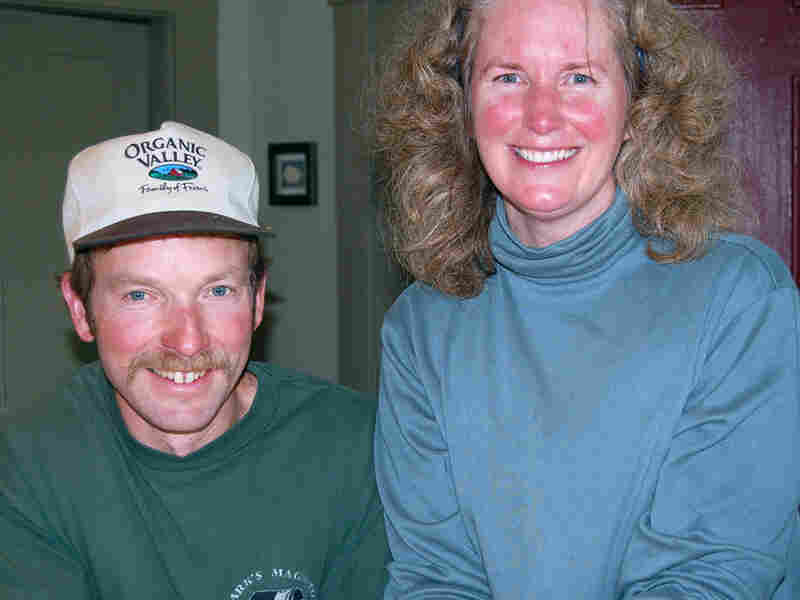 It took Tim and Kristen several years — and a lot of labor — to bring their farm to breakeven. Though all the cows have names, they are also given numbers that Tim Maikshilo says are used to track the cows' health. The cows' milk is tested once a month. To run a successful organic dairy, you have to know your cows pretty well. Tim and Kristen's 14-year-old son, Max, can name every cow, even from across the pasture: "We have Bean, who was Coffee's baby and then Glaze who was Donut's baby," says Max. "And Lisa Marie who's Presley's baby," Kristen adds. The names are cute, but knowing the cows individually serves an important purpose. Because organic farmers can't give their animals antibiotics, catching any potential sickness early is the best health care. "Prevention is a huge part of what we do," says Kristen. Her family does things like check the hooves of each cow nearly every day to see if they're getting an infection. "The hardest part was learning how to treat the cows organically," she says. 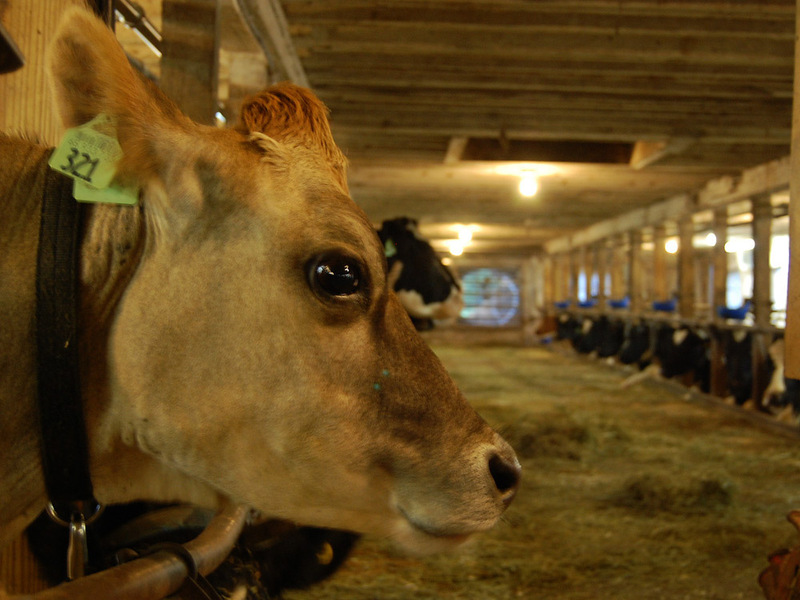 "The milking isn't different, but labor-wise the cows need more attention. If we have a cow that isn't feeling well, we don't come in the house until they're taken care of." But Kristen says all the hard work and expense is worth it. "We actually think they're healthier, because we find they are under less stress, because they get to go out," she says. "Cows love being out on pasture, and you know they're meant to eat grass, and anything else that you give them puts them under stress." Stress makes cows more vulnerable to sickness and can also mean a cow gives less milk. "It truly does give farmers an alternative as to how they're treated and what's being done with our milk." Still, in today's economy, even organic farmers are feeling the pinch. Last spring, the Organic Valley co-op voted to reduce overall production by 7 percent. "A year ago, we were booming, and so we agreed to take on more farms," Kristen says. But when the demand for organic milk didn't keep up, "as a co-op we decided it wasn't fair to the farmers to say, 'We don't need your milk now.' It would be devastating for them." The cutbacks help keep the co-op afloat — which is vital for all member farms — but means that individual farmers like Tim and Kristen are bringing in less money while they still have the same production costs. Tim and Kristen's dairy is making just enough for both of them to be full-time farmers. Still, they can't afford health insurance, and they have had to make other cutbacks. "We've let our hired help go, because we have to reduce our costs," Kristen says. "So now it's just the three of us." They have had to postpone plans to expand, but Tim and Kristen feel lucky their dairy is in the black. And they trust the organic movement will weather the economic downturn.